Cuisinart exists since the early 1970’s and became successful and famous with high-end food processors. Since then the range of products has broadened considerably and includes now temperature controlled kettles as well. The slender stainless steel heater comes in the traditional kettle design. Not very exciting but shapely for every kitchen countertop. There is a window to check the water level, and a blue light indicates when the kettle is on. 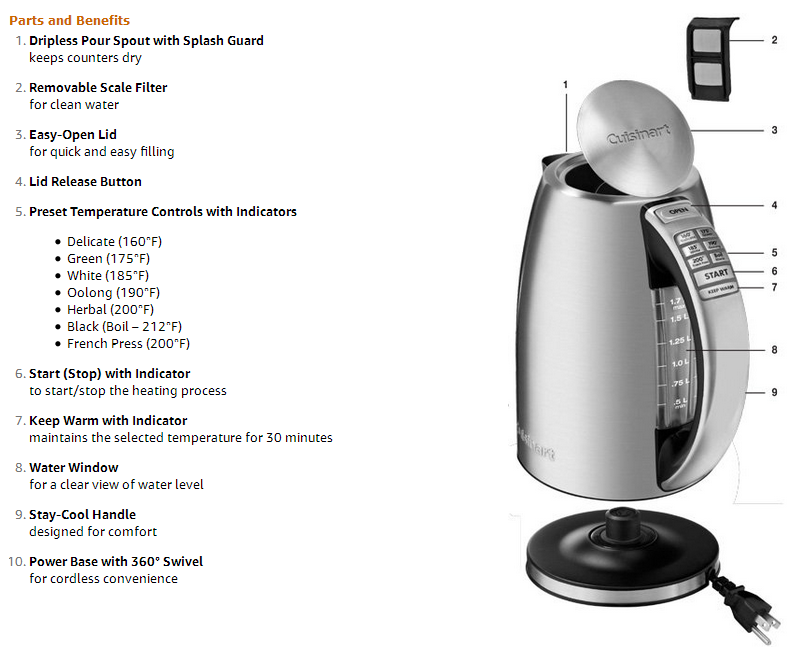 Cuisinart allows six preset temperatures, sufficient for most uses. The kettle comes with a 3-year limited warranty. The limitations are not obvious but seem to concern mainly commercial resellers. For “normal customers” it is crucial to register your purchase with Cuisinart to avail of the warranty (registration card is included). To fill the kettle press the button at the top of the handle to open the lid. Boiling time is about 7 minutes. The temperature control is part of the handle and comes with six preset buttons. You press the required setting, hit ‘start’ and off it goes. The starting point is 160°F/71°C which is low enough for most purposes. Only certain teas require a lower temperature (read more about tea here). A very helpful feature is the internal memory function. It remembers your last temperature setting for two minutes when you remove the kettle from the base. There is also a ‘sleep mode’ in which all lights and the heater are off. The kettle comes back to life by pressing any button or by lifting it off the base and returning it. Suitable for a $$ budget. 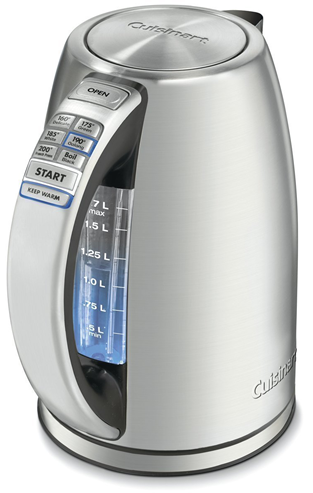 Cuisinart CPK-17 is an excellent choice with everything you expect from a high-end variable temperature kettle. By buying other Cuisinart products, it allows you to match the look and feel of your kitchenware. Even if you don’t, you still pay for the option. 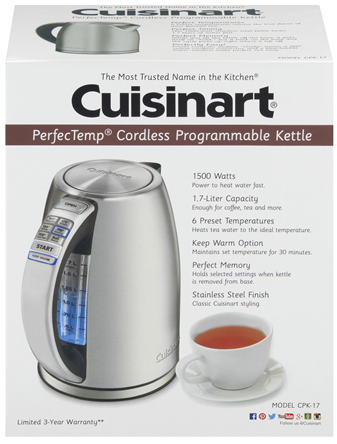 Entirely beside the point: I cannot get used to the weird pronunciation of the companies name: Cuisi-nart?! To go to the manufacturer’s website: click here. To buy fromAmazon click here.